NAIS Membership is Dirt Cheap coming out to only $3.55 per month! NAIS is The Largest Trade Association with well over 3,000 members! New-Listen To The New Audio Testimonials! SAMPES FROM THE ABOVE AUDIO LISTEN MENU! NAIS-THE INVESTIGATIVE NETWORK THAT WORKS! Listen To What John Hoda, Squire Invetigations, Inc (ISI), Milford, Ct. Listing in the NAIS membership directory: It Reaches more people than any other organization membership directory of it's kind. Many associations have what is called CLOSED membership directories which means that only other members obtain it. The NAIS membership directory gives you wide exposure as it's marketed to people who use investigative services and listed in Books In Print as well as The Directory Of Directories. HIUGE MEMBERS ONLY DISCOUNTS THAT SAVE YOU UP TO 50% OR MORE! NAIS members get stnadard every day discounts on books, training programs and equipmnet but aside from that, we have a new members only page that features the latest in PI Gear and equipment that will save you up to 50% or more! "Without you and your researchers, it would be difficult to maintain a even keel!" Randy Bennett, RBI INVESTIGATIONS, INC. The NAIS online membership directory gives you a listing on the internet in a high traffic- locate a private investigator site. Both your email is hot linked as well as your web site if you have a web site. This high traffic page gives you world wide exposure from the largest association of it's kind and helps you drive traffic to your web site. "Gained a tremendous amount of information and insight!" The NAIS MEMBERS ONLY FORUM is an email based networking solution so you can network with other NAIS members. By subscribing in digest form, you will receive one message per day containing all the posts. It's a way to ask questions, get help, keep up-to-date, refer cases and obtain case assignments from other NAIS members. Easy and simple to operate, you can also send messages to the everyone on the forum by sending one email to the forum address. The NAIS MEMBERS ONLY SECTION on the Internet is massive and useful with some of the best of the Internet for the professional private investigator. PI BITES is an NAIS Newsletter featuring the latest trends , useful site links you'll want to check out and NAIS news. NAIS continues to maintain one of the largest collection of free searches on the Internet published today. Within the NAIS members only section, you will obtain massive numbers of free searches on the internet that you can use in your investigation. Click here to see a sample of just one of the many free search pages. This sample page hands you many free public records searches you can use and it's just one page sample from the NAIS MEMBERS ONLY FREE SEARCH PAGES. 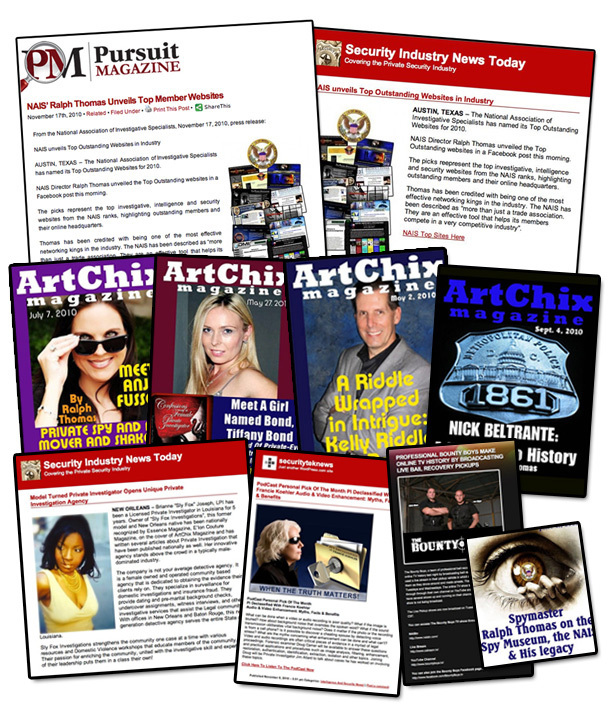 PI Daily is an online newsaper for private investigators that is updated each and every day. You will find it contains hundrdds of news sources you can use to keep up with investigative trends and technology. NAIS maintains one of the Internet's largest collections of articles on different aspects of conducting investigations, investigative technology, tips and techniques. Currently, there are over 400 articles you can access and this achieve is growing every month. For some samples of the NAIS articles, click here. That is correct-free software! The members only section contains a page you can use to obtain thousands of free software you can download and use. "You've done more to enhance the PI business than anyone I know," Leonard D. Topley, Sr.
STANDARD BOOKS AND MANUALS DISCOUNT OF 10% AND SPECIAL MEMBERS ONLY BOOKS AND MANUALS SALES THAT SAVE YOU UP TO 50%. NAIS members obtain a standard 10% discount on books and manuals from Thomas Investigative Publications, Inc. Members also obtain offers and special MEMBERS ONLY SALES and combo offers that save them up to 50%. STANDARD EQUIPMENT DISCOUNT OF 10% AND SPECIAL MEMBERS ONLY SALES THAT SAVE YOU UP TO 50%. NAIS members obtain a standard 10% discount on all equipment offered. They also receive special members only equipment sales that save them up to 50%. "If you are not a member of the NAIS, you are sitting in the last row behind all competition,"
FREE PUBLICITY REFERRALS: It's a fact. NAIS refers more publicity to private investigators than any other organization. Some of the media organizations we have worked with include 20/20, 60 Minutes, 48 Hours, The Washington Post, The New York Times, Entrepreneur Magazine, and many other print and television news media sources. CERTIFICATE OF MEMBERSHIP: You will receive a handsome two color membership certificate with your name on it- you will want to frame in your office that certifies that you are a member of NAIS. You also obtain a special certificate of appreciation made out in your name for your continued support of the private investigative profession. SPECIAL MEMBERS ONLY SECTIONS: Tons of NAIS members only special pages. NEWS ALERTS! Through NAIS is will obtain new alerts when we see very important breaking news about the PI profession so you stay up-to-date internationally when new is breaking related to the private investigative profession. CASE REFERRALS: Case referrals go to individual members. YEARLY CONVENTION AND TRAINING CONFERENCE: Each year NAIS holds a conference. 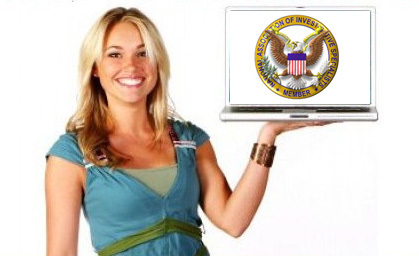 NAIS CERTIFICATION PROGRAMS: NAIS maintains several certification programs in skip tracing, insurance claims, computer technology and other subjects. You will also be interested in the special NAIS Expert Certification Program you can become involved in. Certification in a certain aspect of conducting investigations is a way for you to be recognized for your special skills and knowledge and is highly recommended. LATEST CUTTING EDGE ADVANCEMENTS: NAIS keeps you up to date in advancements in various aspects of investigative technology. "Have recently received requests for services as a result of joining NAIS,"
MARKETING TRENDS: NAIS keeps you up-to-date with the latest trends and marketing techniques for investigative services. 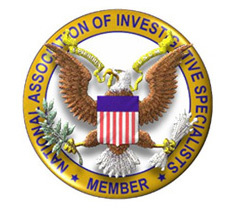 LISTINGS OF OTHER ORGANIZATIONS AND ASSOCIATIONS: NAIS keeps you tuned in and plugged into the investigative industry by keeping it's lists of other investigative associations and organizations up to date. These listings are published yearly in the NAIS membership directory. TOP SOURCES OF INFORMATION: NAIS keeps you up to date on sources of information and information vendors. FREE SELECTION OF INVESTIGATIVE FORMS: Our new investigative forms normally sell for $29.95. They have been recently updated and expanded. They are yours free with NAIS membership. SPECIAL DISCOUNTS: NAIS members obtain other special discounts you will enjoy and freebees such as a huge section of web graphics for private investigators. FREE ANIMATED GRAPHICS FOR YOUR WEB SITE: NAIS members can use the free animated graphics sections and download animated graphics for their web site. These are some of the smartest graphics on the internet for private investigator pages. Click here for review. NAIS Members Get Massive Media Exposure Partly Because They Belong To NAIS! These are just a few samples through various media outlets that get NAIS members exposure! If you are an NAIS member and have an interesting story, we can get it out there! NAIS Members Get Exposure On Their Web Site! Want More Web Site Traffic? NAIS Will Feature Your Site If It's Good. This is a slide show of web sites NAIS has featured. that are appearing on the PEN front page. Click Here To Review Some NAIS Member Top Web Sites! YOUR WEB SITE CAN BE ON THESE PAGES TOO! THE NAIS NETWORK IS THE NETWORK THAT WORKS! IT'S THE ONE ASSOCIATION THAT PAYS TO BELONG TO INSTEAD OF JUST COSTS! ON THESE PAGES! JOIN TODAY BECAUSE WE KNOW YOU WILL BE VERY HAPPY THAT YOU DID! WATCH A VIDEO ON WHY YOU SHOULD JOIN! Watch A Video On Reasons Why You Should Join NAIS Now And Start Obtaining Benefits!